Not rated. On DVD 5/28. Ok for kids 2+. The Bubble Guppies are stars of a Nick, Jr. preschool show set in a vibrant, aquarium-inspired underwater classroom. Molly, Gil, and their fish-tailed classmates are just like all preschoolers -- learning about the world around them through playful investigation. The show covers a wide range of topics, from dinosaurs to dentists, rock & roll to recycling, colors to cowboys, teaching kids about science, math, literacy, and lots more. 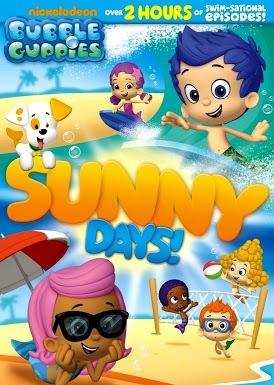 This DVD includes six episodes: "The Beach Ball!," "The Legend of Pinkfoot," "Bring on the Bugs," "The Sizzling Scampinis!," "Bubble Duckies" and "Gup, Gup, and Away!"